Autumn Festival Season is just around the corner. 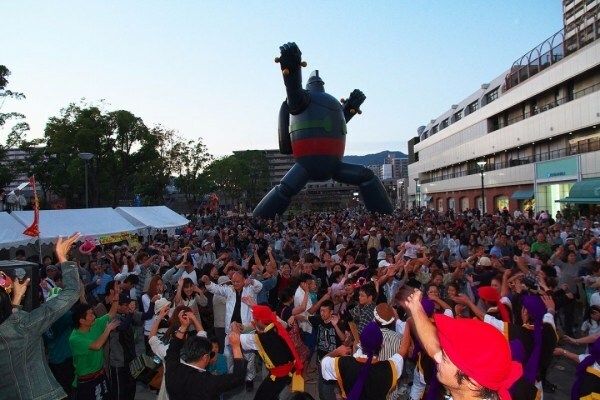 Here are some festivals you can attend in Hyogo! Currently events listed are for the long weekend. Next year Akashi Castle will celebrate it’s 400th anniversary of construction. You can learn about the castle’s history through various performances . There will also be a tea ceremony and flea market. – Has a special lion dance performance which is designated as the intangible folk cultural property of Hyogo prefecture. The festival is referred to as a “fighting festival,” as participants slam portable shrines known as mikoshi into one another in a display of dominance. Eight Kylin lions in the festival, called Kejishi, are covered with black hair from heads to tails. Unlike regular Kagura (Shinto dance) lions, they are wilder animals. The head of Kejishi weighs 5 kilograms and its body weighs 15 kilograms. This is a folk festival that takes place around Inano Shrine in Itami every autumn and spring. Traditionally a celebration of the harvest, the main event of the autumn festival has a futondaiko drum routine. Also will have flea markets. The autumn festival is held on the first Sunday of October every year and this has also been designated as an important Intangible Folk Cultural Property by the prefecture. It is said that his festival started in the Muromachi period, and its name came from the Kagura (sacred) song “Iyaho, Iyaho”. Tens of thousands of people gather for the chance to say goodbye to bad luck, making this the most bustly and lively event of the year. The main attraction of Arai Shrine’s autumn festival is the Niwaka Drum (a cultural property of Takasago City). The Niwaka Drum is a unique festival in which performers playing three roles such as dancers, riders, and carriers of floats which come together and the strength and vigor of the men who push floats are combined. All dolls are handmade and performances are mainly historical ones. The Shinko Festival held on October 10 is a festival in which the deity of the Takasago Shrine rides on the mikoshi portable shrine, goes around each point and district, and brings protection and grace. Eight Yatai floats scramble in one row in front of the shrine at night on the 11th, and the festival reaches its climax. This is the biggest event of the Sone Tenman Shrine and is held on October 13 and 14 every year. This is a gallant and splendid festival with the Hitotsumono Ritual, the Omenkake, the Cutting of Bamboo, and the colorful Neriawase of the 15 Futon Yatai floats. Reenaction of 100 samurai warriors departing from the clan’s residence and walking through the town. You can also try local specialties such as Tamba chestnuts , black soybeans and rice dishes. This event is also known as the Fighting Shrine Festival. Four major portable shrines, each representing a part of the town (north, east, south and west), are paraded through the town. The climax of the festival is when the shrines meet in the middle to battle. This is one of Kinosaki’s largest festivals, one not to be missed! The festival is held for two days every year in October on the 14th and 15th. The main event, the shrine battles, takes place on the second day in the center of town near Ichino-yu. The Autumn Festival is also known as the Danjiri Festival. Danjiri are large wooden carts (danjiri guruma) in the shape of a shrine or temple. The festival celebrates a good harvest for each year, and involves men using 17-meter long poles to attack each other’s danjiri. This creates a vigorous and compelling sight, exciting for all who attend. Because of its aggressive style of celebration, it is also known as a ‘fighting Danjiri’.